Louisiana is known for good food and LSU has a reputation for enthusiastic football fans. With the Super Bowl coming up; a friend and I reached back in time to LSU’s Tiger Bait Cookbook and made recipe picks for a football buffet. 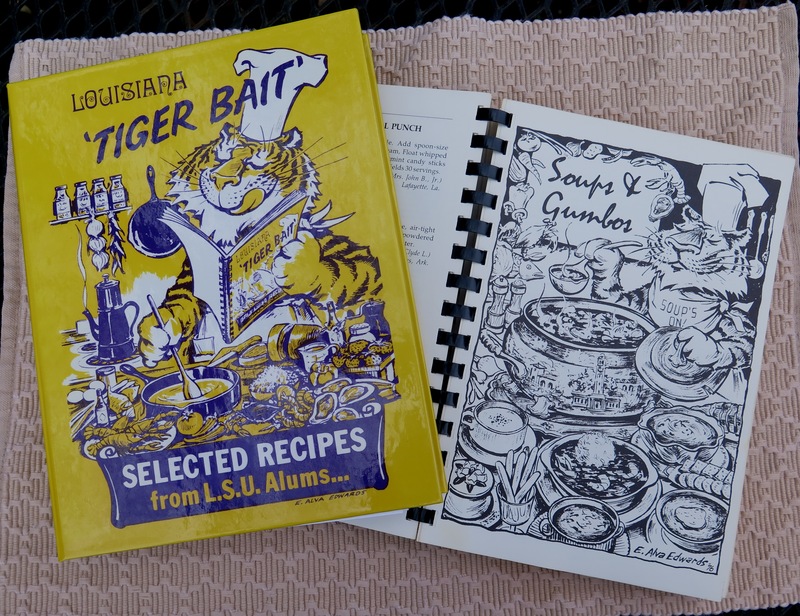 Our picks came from the Tiger Bait Cookbook which was compiled of recipes submitted by LSU alumni during the 1970’s. Alice and I both graduated from LSU and we love this cookbook. For favorite recipes, Alice likes “Sensation Salad Dressing” and one of my favorites is “Jambalaya”. Hum, this would make a great buffet for a football party, so I decided to feature our recipe picks during week of the NFL Super Bowl XLIX game of the Seattle Seahawks and New England Patriots. Sensation Salad Dressing is just a knock-out salad dressing. Deceptively simple, but so, so good. It was a standard menu item at many old, established Baton Rouge restaurants and was originated by Jake Staples, a long time restaurateur of “The Place”. If fact, I didn’t realize that this was a local invention and is seldom found outside of the city until researching my blog post. 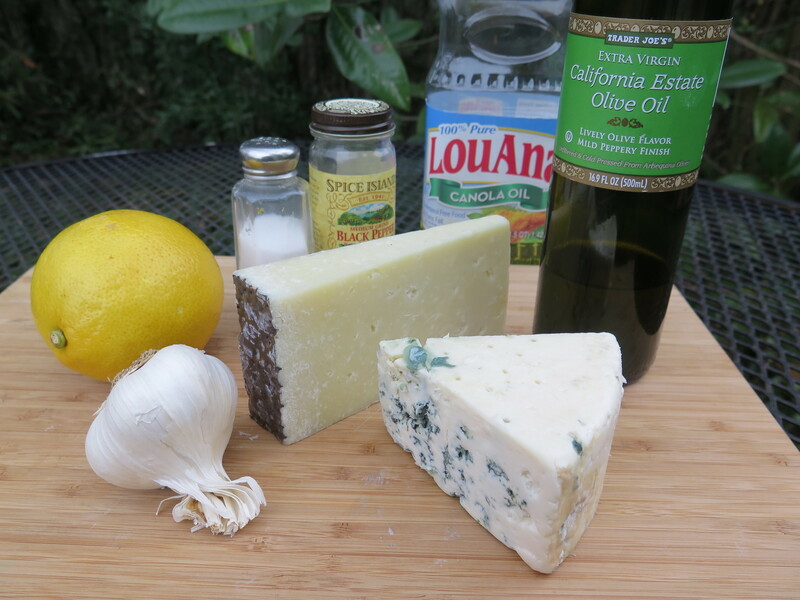 The dressing is a simple one–olive oil, vegetable oil, crushed garlic, fresh lemon juice, salt and pepper, bleu cheese and Romano cheese. Originally, it was always served over cold, torn iceberg lettuce. Now that has been updated and often a combination of Romaine and iceberg lettuces or mixed greens is used. I do believe that fresh lemon juice and lots of crushed garlic are the keys to the salad dressing. The cheeses also make this dressing memorable. The combination of olive and vegetable oil gives a more subtle flavor, too. There are many variations of the Sensation Salad Dressing circulating on the internet. At restaurants, I have seen almonds, olives, red onions, tomatoes, croutons added. I’m featuring the one that Jack Staples himself submitted to the Tiger Bait Cookbook. Here’s the salad using bleu cheese crumbles and shredded Romano cheese. Grate cheeses and mix together. Set aside. 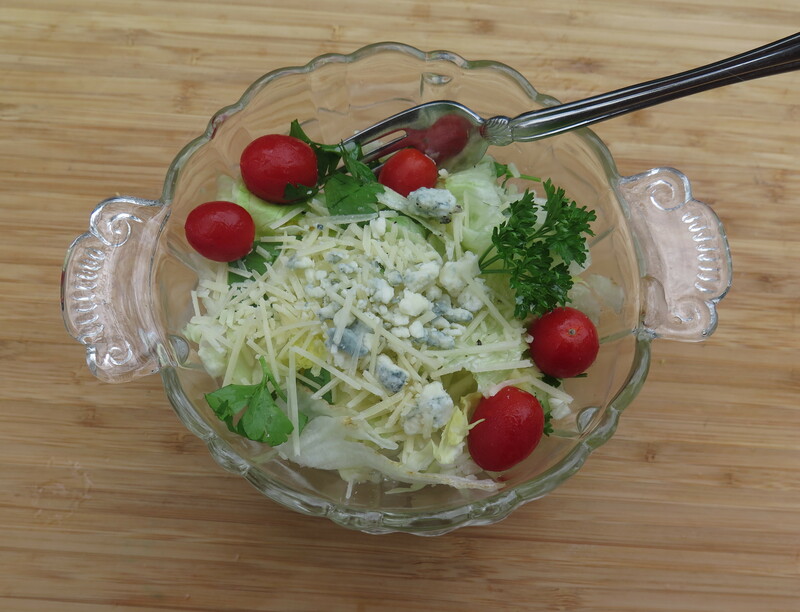 For each individual serving of tossed green salad sprinkle with one tablespoon (15 ml) of the mixed cheeses and three tablespoons (45 ml) dressing. Hint: Freeze bleu cheese to grate. For a buffet, I suggesting mixing the cheeses with the other salad dressing ingredients and adding to the salad greens, combining well, shortly before serving. The first photo shows the dressing in a carafe before combining. The Jambalaya recipe is also straight-forward; it is probably the recipe I used when learning how to make this dish years ago. This recipe makes a huge quantity and a large 6 quart pot, Dutch oven or cast iron kettle is needed to accommodate all the ingredients–I use an enamel-coated cast iron pot. Here are the ingredients; it is a chicken and sausage jambalaya. To make the jambalaya, sear the sausage and chicken pieces. Then saute the onion, garlic and bell pepper. Add everything to the pot and simmer on the stove (or gas cooker outside) until done. This recipe is not spicy or “hot”; optionally add Cajun seasoned salt, Tabasco sauce or hot sausage to make it more spicy. Using chicken broth for the liquid adds flavor as does a small amount of tomato sauce. If using purchased chicken broth or bouillon, the 1 tablespoon of salt in the recipe can be decreased. Of course, long grain rice is the standard rice for jambalaya recipes; uncooked rice is added to the pot. 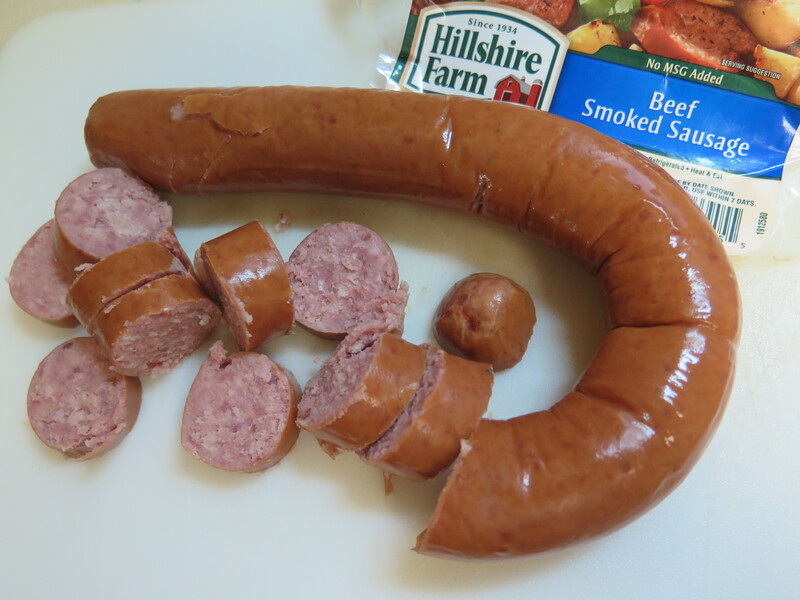 For sausage, my favorite is beef sausage with a thin casing–just a preference. This recipe uses a whole cut-up chicken. Most jambalaya recipes today use de-boned chicken rather than whole chicken pieces. 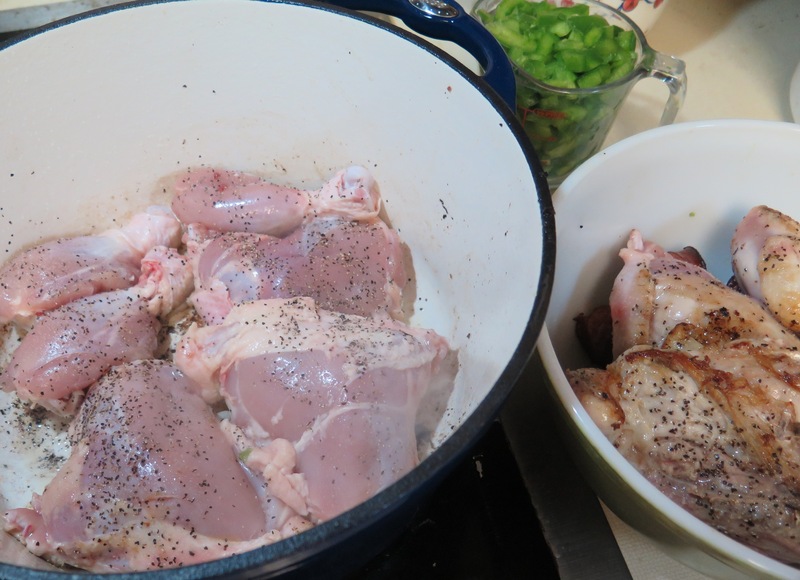 However, chicken with bone adds flavor; I used leg chicken quarters (split at leg and thigh) with skin and fat removed. These are seasoned with salt and course black pepper and browned in the cast iron pot before adding to the remainder of the ingredients. The jambalaya can simmer on the stove as long as needed; watch the game and enjoy a Sunday evening. Remove meat, reduce heat, and saute vegetables until onions are clear. Add seasonings, Worcestershire sauce, broth and tomato sauce; simmer for about 15 minutes. Add meat and rice, stir well. Cover and cook over medium heat for about 30 minutes; stirring occasionally to prevent sticking. Cook an additional 20 minutes over very low heat, without stirring. Serves eight. Editors Note: If chicken broth is prepared from chicken bouillon cubes, reduce salt. 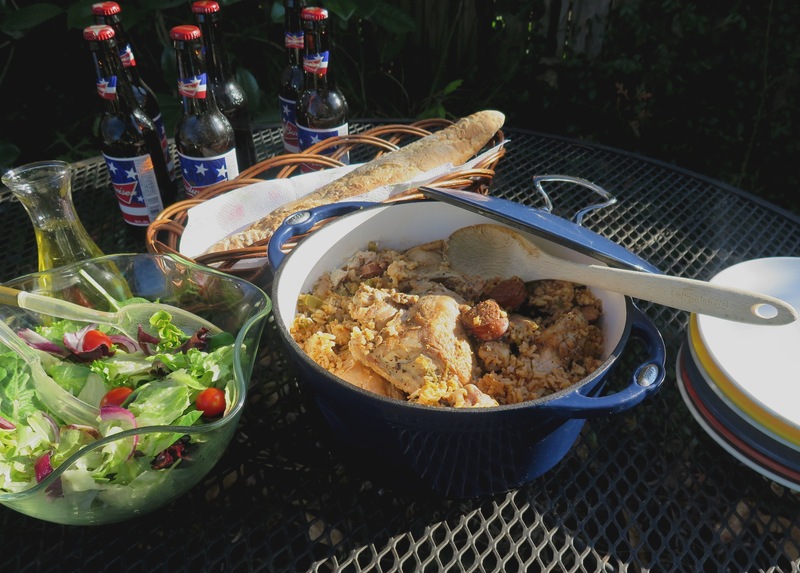 In Southern Louisiana, jambalaya, salad, French bread and beer, is a typical casual meal and buffet. Enjoy! Here are some notes on the Tiger Bait Cookbook and origins of the Sensation Salad Dressing. The Sensation Salad was “invented” at an old, popular restaurant, Bob and Jakes. The Staples brothers eventually split up in the early 1970’s and went their separate ways. Bob’s restaurant endeavors became Boudreaux Catering on Government Street. Jake Staples opened a restaurant on Florida Boulevard called Jake Staple’s The Place. He brought the Sensation Salad and Dressing to his new restaurant which was popular for many years; eventually changing owners in 1984. Most local restaurants during the 1970’s (from my memory) served some sort of similar salad. Baton Rouge locals many remember the Sensation Salad served at now closed Italian restaurants — Giamanco’s (1958-2002) and The Village. I vaguely remember the salad at Don’s Seafood Restaurant (now it’s called an Italian Salad) and Ralph and Kacoo’s. The salad is gradually fading off restaurant menus; however, a version is still listed on the menus at Ralph and Kacoo’s Restaurant, Portobello’s Grill and Louis DeAngelo’s Pizzeria Company. There are probably additional restaurants in the area, too, which serve the salad. Alice and I both graduated from LSU. 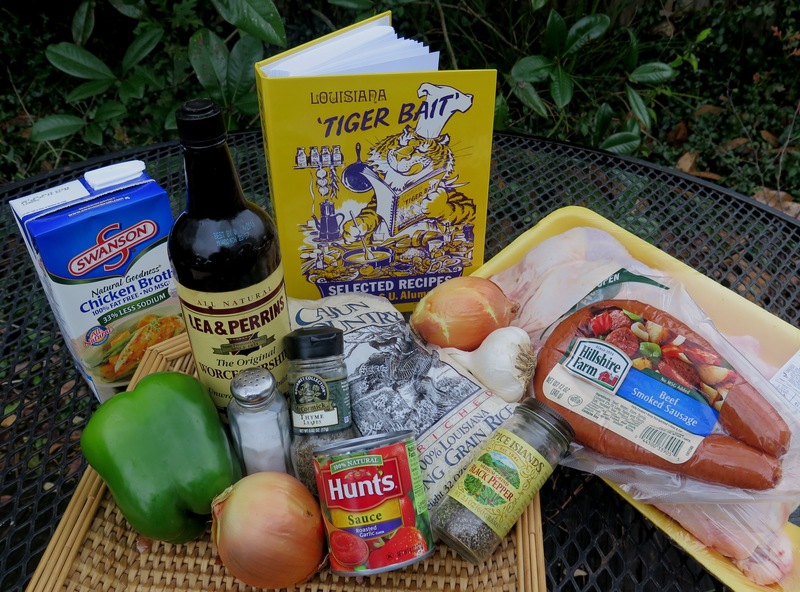 Recently we were reminiscing about our LSU student days and were surprised to discover that both of us use the Tiger Bait Cookbook (named after LSU’s mascot–a Bengal tiger) so much. The cookbook is a time-honored one; I’ve referred to it over and over throughout the years especially when searching for South Louisiana recipes. All the recipes are winners. My cover is missing and pages are bent. Alice purchased a replacement for her worn out cookbook. 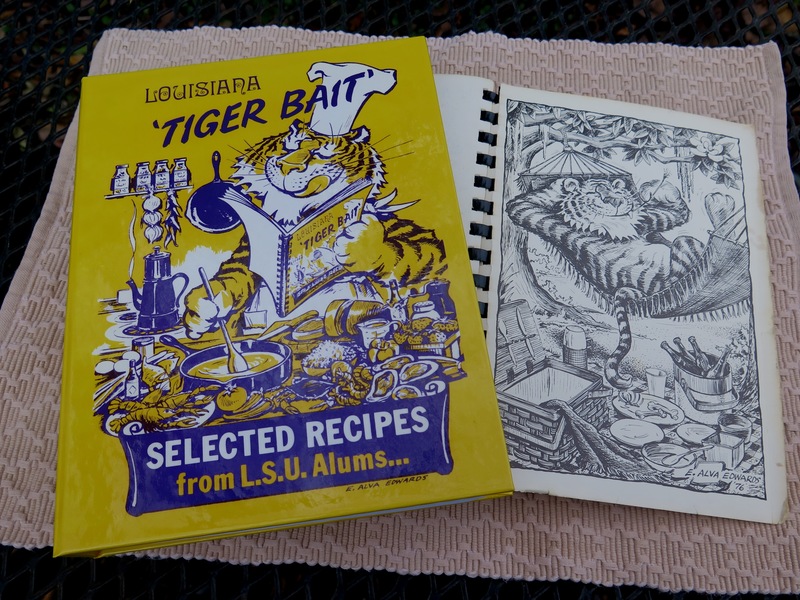 LSU alumni published the Tiger Bait Cookbook in the 1970’s. The cookbook was the idea of alumni director, Jak Jalenak, and his wife, Frances. Alumni submitted 1500 recipes which were rated by multiple testers (Home Economics alumni) and the best ones were chosen for the cookbook. This effort was coordinated by Dorothy Howell, LSU Home Economics teacher. I was a student at the time and remember Ms. Howell’s office in the attic of the Home Economics building. She had a gregarous laugh and enthusiasm. We’d walk by her office from time to time to see what she was doing–she’d be typing (yes, on a typewriter) with stacks of recipes all over the place. The cookbook turned out well. It was very meticulously done; only the highest rated recipes were included. With all the good cooks in South Louisiana, recipes chosen were a good representative of the area and beyond. The ingredients and quantities are realistic and are listed in both standard and metric measures. But typical to that time period, generous amounts of butter/margarine are ingredients in some of the recipes and canned soups are not uncommon. Nevertheless, adaptations can be done to make some of the recipes a little more healthy and updated. Each chapter of the recipe book begins with artwork provided by an LSU student, faculty member or community artist. This adds a fun touch to the cookbook. The cookbook is now in its sixth printing and can be purchased at the LSU Alumni Association Gift Shop in the Lod Cook Alumni Center on the LSU campus. It can be purchased on the internet at giftshop.lsualumni.org/tiger_bait_lsu_cookbook-details.aspx#.VMfqG9LF_is. The cookbook is a classic; if you are an LSU alumni it makes a great gift. It’s a good Southern cookbook for your recipe collection. Traditional Sensation Salad, Copyright © 2007 Chef John Folse & Company. 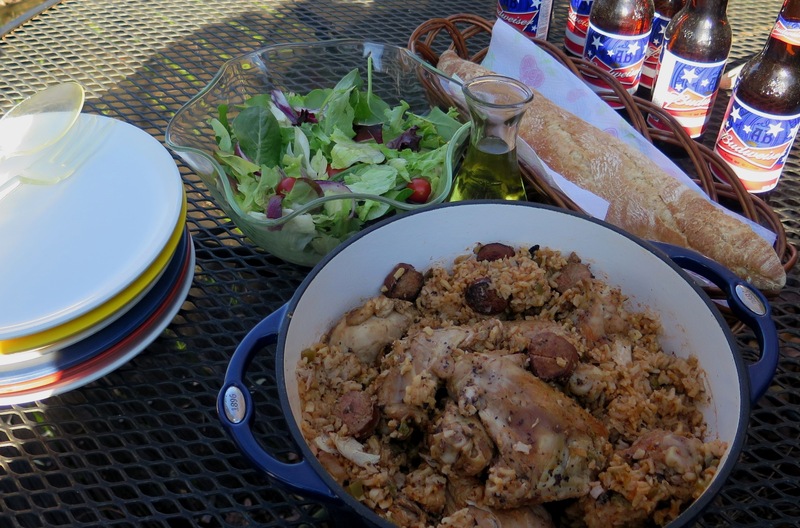 This entry was posted in Louisiana Culture, Recipes and tagged Jake Staple's The Place, jambalaya, LSU Tiger Bait Cookbook, recipe picks for super bowl, Sensation Salad Dressing by Maylee at Beyond Gumbo. Bookmark the permalink.